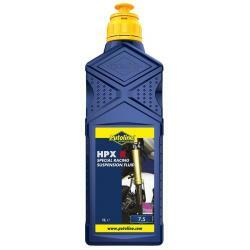 This is 1 Litre bottle of Putoline HPX synthtic based fork oil. Available in four different weights, 2.5W, 5W, 7.5W and 10W. These are all compatible, so you can easily mix these to get the weight you require. Please choose your preferred one from the dropdown.